Lake Mitchell is 5,850 acres with 147 miles of shoreline. Lake Mitchell is located approximately halfway between Birmingham and Montgomery in the center of Alabama. It is part of the Coosa River chain between Lake Jordan and Lay Lake. The majority of Lake Mitchell is wildlife protected and is one of the few lakes on the chain that is not flood control. The water level remains stable all year round, with the exception of a relatively small drop of about 4-8 feet every few ...Learn more here! Lake Mitchell is 5,850 acres with 147 miles of shoreline. Lake Mitchell is located approximately halfway between Birmingham and Montgomery in the center of Alabama. It is part of the Coosa River chain between Lake Jordan and Lay Lake. The majority of Lake Mitchell is wildlife protected and is one of the few lakes on the chain that is not flood control. The water level remains stable all year round, with the exception of a relatively small drop of about 4-8 feet every few years for dam maintenance. Some of the interesting key locations on the lake are Lay Dam, Mitchell Dam, Blue Creek Marina, Lake Mitchell Marina, and the public boat launch. Stretching about 14 miles long, and around 140 miles of shoreline, Lake Mitchell is a beautiful reservoir. Mitchell Dam is the second oldest of 14 Alabama Power Company hydroelectric generating plants. The dam was named for James Mitchell, Alabama Power president from 1912 to 1920. 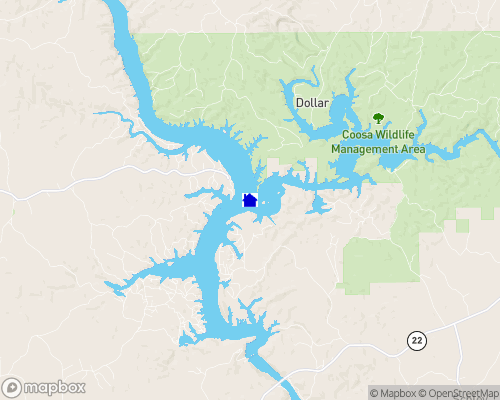 Located on the Coosa River near Verbena, the dam straddles the Chilton and Coosa County line. A unique feature of the new powerhouse, which was completed in 1985, is a 1,140-foot floating trash boom that deflects trash from the powerhouse intakes. A fishing facility located below the dam is open year-round to the public. Parking, restrooms, picnic tables and an overlook are also available for public use.